Enjoy this guest post from local chef – Emma Frisch! This can be whipped up in 25 minutes, before guests arrive for lunch. 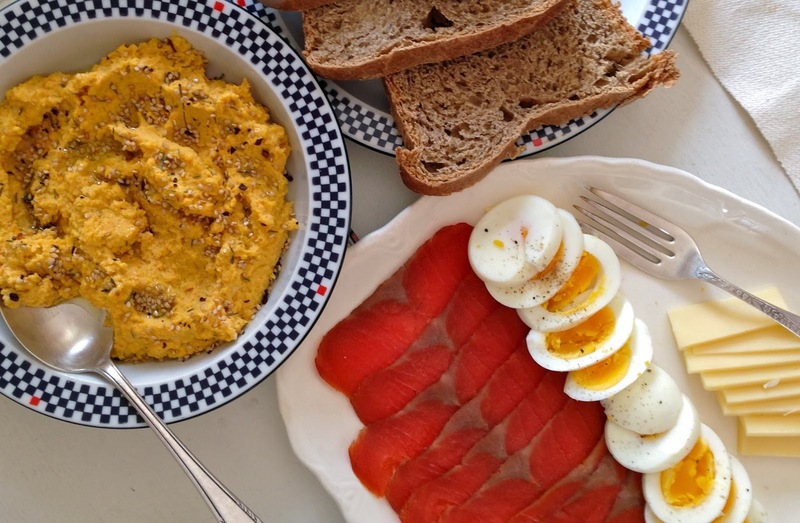 Make it the centerpiece and serve alongside fresh bread, hard-boiled eggs, slices of whatever cheese on hand and any special surprise you’ve been harboring in your pantry or freezer, like Nova Salmon (Wild for Salmon). Ah, the gentle rutabaga, mellow in flavor and mild in color with butter and purple hues. Like turnips and carrots and beets, this winter root tends to make it’s nest in the refrigerator drawer. There are only so many gratins, soups and roasted medleys one can have before the weather begins to feel monotonous. If you are not as familiar with rutabaga as you are with carrots and beets, you’ll be pleasantly surprised. They are happily shaved into salads and prepared any other way you might a root, too! Fill a medium pot with water and salt it generously. Taste the water – it should remind you of an accidental ocean gulp. Add the rutabaga and carrots, and bring to a boil. Boil for about 15 minutes, or until the vegetables are fork-tender. Use a slotted spoon to transfer the vegetables from the pot to a food processor. (Save the broth for making soup). Add the tahini, garlic, lemon juice and miso to the food processor. Whip into a puree. While blending, pour the olive oil in a steady stream to bind the flavors and create a smoother consistency. If the hummus is too thick, add a tablespoon of the vegetable broth at a time. Garnish with a swirl of olive oil and sesame seeds, thyme, red pepper flakes and sea salt.